PAN Number which is a ten-digit alphanumeric unique code. Through your PAN number, the Income Tax Department keeps an eye on all your transactions that requires your PAN Card like depositing money in your bank account over Rs 50,000 at one time, buying goods and services more than Rs 2 Lakh etc. 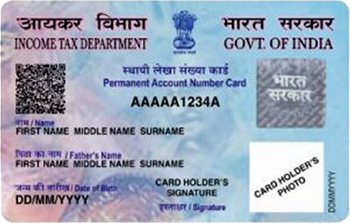 What is significance of 4th letter in the PAN card number ? How does the 5th digit depict the last name of the holder? Why should I need a PAN Card? But what if I don't file my Income Tax Return and I've got nothing to do with the Income Tax Department, do I still need it? Is it mandatory to apply for a PAN, even if I don't fall in any of the above categories? What if my minor child enters in the abovementioned transactions? What happens when I enter into such above mentioned transactions without having PAN card? Is it different from other ID proofs? How? What are the types of PAN application form? How much time will it take to receive my PAN card? I am not a citizen of India, is the procedure for applying PAN different for me? I applied for a PAN some time ago and haven't received it yet, what to do? Can I have two PAN cards? Can I apply a PAN on behalf of someone else? I have lost my PAN card, now? How to correct any mistake or change any data in my PAN card? My address has changed, do I need to apply for a new PAN card? I forgot my PAN number? What to do? What happens in case of any contravention relating to PAN? In case of an individual, the 5th digit is the first letter of the last name / surname. For example, Ms. Tania Gupta applied for a PAN, then the 5th digit of her PAN will be "G". But, in case of a non-individual, the 5th digit shall denote the first character of the PAN holder's name. Let's say, Tania Limited applied for a PAN, then the 5th digit of the unique number allotted to it will be "T". Mutual fund / company / RBI for acquiring units / debentures / bonds issued by it when the total amount paid during the year exceeds Rs.50000. Goods and services of any nature other than those mentioned above for an amount exceeding Rs. 2 lakhs per transaction. payment instruments issued by RBI to a banking company or a co-operative bank or to any other company or institution. If any minor enters in these specified transactions, then he can quote PAN of his parents or guardian.But when the income of the minor child exceeds Rs 2,50,000 which is chargeable to Income Tax then he cannot quote PAN of his parents or guardian and will be required to have his own PAN card. In case you don't have a PAN number and you enter into any of the above mentioned transactions, then you are required to file a declaration in Form No. 60. A Form 60 is just a form containing basic details such as your name, the transaction you are entering into, any return if filed and the reason for not having a PAN. Also, a valid proof of address is to be attached with Form 60. Yes, totally. Other ID proofs such as Aadhaar Number Cards, Driving License, Passport etc. are issued to only Indian citizens, while a PAN card can be issued to non-citizens / foreigners too who have dealing in specified transactions stated above as it is not a proof of Indian Citizenship. Form 49AA - Application for allotment of PAN to be filled by foreign citizens. In case of a company which has not been registered under the Companies Act, 2013, the application for allotment of Permanent Account Number (PAN) may be made in FormNo.INC-7 specified u/s 7(1) of the said Act for incorporation of the company. No, the procedure for applying a PAN is same for every individual, whether an Indian citizen or a Foreign citizen. The only difference being Form 49AA is to be filled and submitted through an authorized representative at any authorized PAN centre instead of Form 49A. However, you may find the online mode of application easier and more convenient which provides for online payment of fees using various options. In any such case, where you have applied for a PAN card and wondering where it is, simply just track the status of your PAN card with the help of acknowledgement number issued at the time of applying for a PAN or consult our experts. No person can hold two PAN's and thus, if you have more than one PAN, surrender it immediately to the income tax department. In fact, a penalty of Rs. 10,000 can be imposed on you in such a case. Such other persons who are required to be represented by an Authorized Representative. A request for re-issue of PAN Card is to be filled in by selecting the appropriate box on the left margin of the application form naming “Request for New PAN Card or/ and Changes or Correction in PAN Data” along with the correct documents as a proof. No. A change in address is just a change in your jurisdiction and assessing officer, and no application for a new PAN is required in such a case. Only, the change in address is required to be intimated to the income tax department for successful updation of their database for future correspondence.